I like to look through antique quilt collections to find a quilt that jumps out, that doesn't follow the recipe, that works as an abstract design as well as a bedcover. This miniature Oak Leaf quilt was inspired by a c. 1890 quilt, but the center medallion appliqué is a throwback to a very early 1800's quilt style. The leaf motif stylized in bold form, acid green on cheddar with red, grabs your attention. Pieced borders of scrap fabric, faded over decades, encircle and contain it. 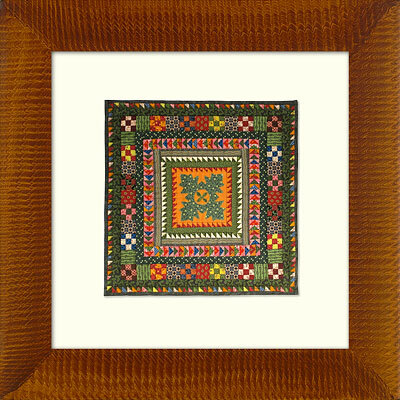 I focused on the dramatic center appliqué Oak Leaf and pieced the borders in Sawtooth, Flying Geese, and Nine Patch patterns in brighter colors. Splashes of color to cheer a day.